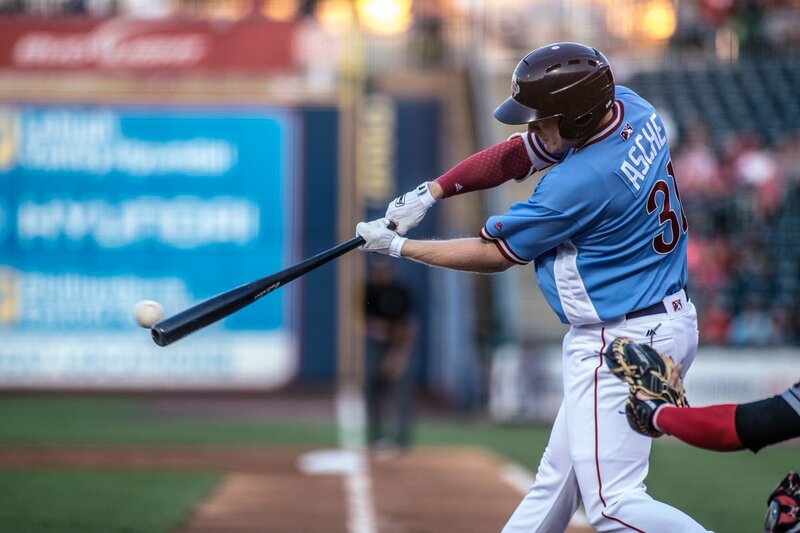 The IronPigs lost 5-4 last night in a game that certainly was winnable. A lot of guys looked to be taking big hacks at the ball early in counts–maybe looking to pad the season stats a bit. No matter in a game that doesn’t really count. But still, they didn’t give up in any way–almost came back to win it. Cam Perkins wasn’t hacking; he was content to line singles to the outfield and steal bases and play good baseball. If you squint your eyes a bit, he had the look of a right-handed Rich Thompson. He’s not Rich in center field, yet–or on the base paths, but you get my point. I don’t think he’ll get the call, even though he deserves it. There’s just gonna be no room on the 40-man with all the Rule 5 protections that need to come down. A temporary move and then waive him? The Phillies don’t usually operate that way. We’ll see, though, I’d certainly love to have him around here for a while longer–although I guess that’s not really the point. Asche looked good; he’s settling into the cleanup spot vacated by Ruf. Knapp missed his second straight game, but I’m told he’s OK. We got our first look at Jimmy Cordero in AAA–and it wasn’t exactly pretty. He navigated his way through the first inning with his slider at 88-91 and his heater at 93-96. He hit at least 97 in the second inning, but I didn’t see any triple digits yet. I’m not sure he’s ever really going to be a multi-inning guy. And the AAA hitters seemed to see his fastball really well. Keeping the heater in the upper 90’s and command and control on the slider will be the keys for him. It’s basically the Ken Giles plan. However, I’d keep him out of leverage situations in the playoffs if we can help it. Garcia and Araujo deserve those. Let Jimmy set some stuff up in more of a one-inning Colt Murray role. No movement lately as we still stand at 23, two short of the IL maximum. I’m still thinking we’ll see a couple small moves prior to Wednesday–but nothing major. I’m thinking guys like Infante and Aguila coming from Reading to fill out our bench. Seats still remain for this game, but many of the good ones are already gone. The Red Wings will send the lefty Hurlbut (0-1, 2.45) today, after shuffling their rotation to call up top-prospect Berrios to start for the Twins today. RHP David Buchanan (9-9, 4.15) will go for the IronPigs, looking to get himself right for the playoffs and a possible spot in the Phillies September rotation, as they begin to shut down some of the young pitchers. It’s not a meaningless game for Buck today. Fan Appreciation Day: $1 hot dogs, $2 popcorn, $2 sodas all game long. Other concessions may go on “sale” after the 7th inning. Might be partly-cloudy and breezy, but looks like a nice one. Will the bar run out of Bloody Mary mix? It’s happened before, and they’ve been running out of a lot of things, lately. Will the Phanatic get involved in the pork race? Speaking of the Pork Race, here’s how I would finish out the season shenanigans: While the race is getting started, the grounds crew re-attaches the hose to the nozzle behind the pitchers mound. As the pork racers come down, the phanatic comes out and grabs the hose and soaks the entire dugout and everyone in it. How will Buchanan do? A really good start here will go a long way towards confidence in the playoffs and a couple MLB starts later this month. Go get ’em Buck! Will Knapp be back? Again, I’m told he’s fine, but we do need his bat (working) in the playoffs. Not that I don’t like LoMo for his defense, though. Will they re-stock the playoff T-Shirts? They were pretty picked over last night, but I didn’t get down there until late. Will they do anything else to “appreciate” the fans today? It seems like all the teams have these “days,” and nothing really special happens. I’d like to see one team–Phantoms, IronPigs, SteelHawks, SteelFC–just go “all out” on a day like today. What would that entail? Reading did a pretty good job with it the other night. Let me think about it more–stay tuned.